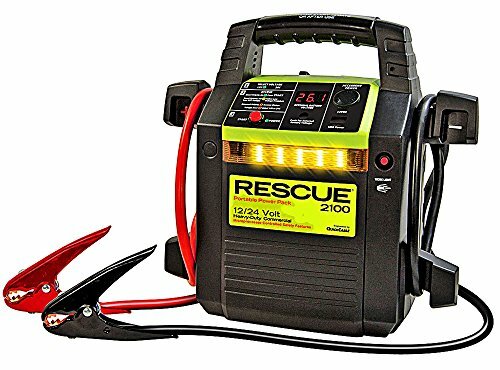 The Rescue 2100 is a second generation dual voltage portable power pack that uses advanced technology microprocessor controls to offer a level of safety and performance that is unique in the industry. The advanced analytical display on the membrane panel provides user feedback on the state of the external battery to be jump started as well as the batteries inside the Rescue 2100. Quick Cable's exclusive voltage and polarity protection prevents the unit from engaging when the unit is connected incorrectly, either through reversed polarity, or incorrect voltage setting. The Rescue 2100 can also be used in very low voltage situations or as a power source for 12V or 24V equipment without the polarity and voltage protection features. An all-new digital battery meter displays both internal and external battery voltage, and indicates recharging and fully-charged internal batteries. LED's signal system voltage selection, low internal battery voltage, low voltage situations and reversed polarity. A 12V cigarette-style power outlet protected by an internally-resetting 15 amp circuit breaker, and a USB® charging port are both provided. A selectable worklight/safety flasher is built in. Like all Rescue portable power packs, the 2100 comes with a built-in battery charger. The 62" booster cables are all-copper welding cable to stay flexible even in subzero temperatures and feature heavy duty parrot clamps. With 900/1600 peak amps at 12V, the 2100 offers commercial-grade power for cars, trucks and commercial equipment in a hand-carried package. If you have any questions about this product by Quick Cable, contact us by completing and submitting the form below. If you are looking for a specif part number, please include it with your message.